This Thursday, July 31st, is National Heatstroke Prevention Day (NHPD). Already this year at least 18 children have died of heatstroke from either being left in or having gained access to a vehicle. Please take a minute to share information about this event to stop further tragedies. I have put together a NHPD Resource Page with links to a variety of organizations' information about NHPD as well as graphics and information sheets that you are encouraged to share via social media, email, personal contact or whatever means you deem appropriate. One simple way is through a page setup by Thunderclap at https://www.thunderclap.it/projects/13796-prevent-heatstroke-deaths?locale=en. Thanks in advance. Your actions may help save a precious child's life. Also, the 2013-14 San Francisco rainfall season only saw 42 days of measureable rain (i.e., ≥ 0.01”) compared to an average of 67 days. This makes it the 5th fewest number of days of rain. See http://ggweather.com/sf/season.html . Friday, May 23 is National Heat Awareness Day; highlighting that heat is the #1 weather related killer in the nation. The focus of the day is not only on heat wave fatalities but also on children dying in hot vehicles and the risks of UV radiation and related skin disease. And these statistics do not count the 38 children who die each year as a result of heatstroke after being left in a hot vehicle. Already in 2014 at least 5 children have died of juvenile vehicular heatstroke and the sad thing is that every one of these and the 606 other documented heatstroke deaths since 1998 is preventable. For more information, along with safety tips see http://ggweather.com/heat and http://ggweather.posthaven.com/children-and-cars-a-deadly-warm-weather-combination. Please take a moment to raise awareness about these hazards…it just may save a life. With a significant warm-up in California and many parts of the nation this week it’s time for a reminder about the dangers of leaving children (and pets) unattended in vehicles. It only takes a matter of minutes on a relatively mild day for a vehicle to reach deadly temperatures, a fact that is exacerbated the hotter it is. Already this year two children have died after being left in hot vehicles and neither day was particularly hot! Last year there were at least 44 such fatalities and since 1998 the instances are of epidemic proportions with over 600 juvenile vehicular heatstroke deaths. More information can be found at http://ggweather.com/heat/ or contact me directly at jnull@sfsu.edu. Help raise awareness about this issue; it may save a precious young life. 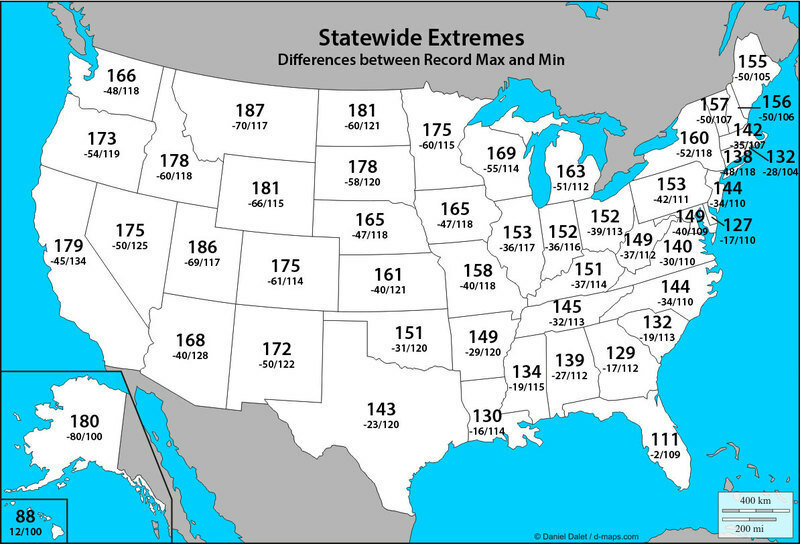 What states have the widest ranges between their record maximum and minimum temperatures? Or the smallest? The largest is Montana which has a range of 187 degrees F between its state-wide record max of 117 and record minimum of -70. Utah is close behind with a range of 186 degrees. And with a range of only 88 degrees is the state of Hawaii where the all-time maximum is 100 degrees and an all-time minimum of 12 degrees (on the summit of Mauna Kea). As the temperatures begin to go up, sadly so do the number of children who die after being left inside hot vehicles. Already this Spring there has been the first such death nationwide. And it does not have to be a blazing hot day in a southern state for these tragedies to take place as evidenced by the fact of deaths in places like Seattle and Milwaukee on mild days. We have all heard about an isolated incident of a child dying in a hot car. However when put into a nationwide context they constitute an epidemic; claiming on average 38 young lives every year in the United States. Since 1998 over 606 infants and children have died horrible deaths due to hyperthermia inside hot vehicles. But you can help save some of these precious lives! Sadly, these incidents often intersect with the early childhood education and childcare communities. Over half (52%) of juvenile vehicular hyperthermia fatalities occur when a caregiver is somehow distracted and accidentally leaves a child in a vehicle. And in nearly half of these cases, the child was supposed to be dropped off at either childcare or preschool. These cases happen to parents, grandparents, siblings and childcare providers. It is often a matter of a change of routine, where one person normally is responsible for a child and on a given day another person forgets they have the responsibility that day. The other categories of circumstances that lead to hyperthermia deaths of children in vehicles are children playing in vehicles and children intentionally left in vehicles. In the former, which account for about 29% of the cases, children gain access to a vehicle and are subsequently overcome by the heat. And sadly in the latter instance that makes up about one-in-five of the deaths (19%), children are intentionally left in vehicles by a caregiver who has to run an errand, get their hair done, go to bar or the casino, etcetera. What is heatstroke (aka hyperthermia)? In the simplest terms it describes heat-related illnesses when a body’s temperature exceeds its normal range. If a body is subjected to extreme temperatures it can overwhelm the body’s ability to cool itself. This is especially true for infants and children whose body’s heat at a rate of three to five times faster than adult. If a person’s body temperature reaches 104 degrees (the clinical definition for heat stroke) their cooling system is overwhelmed to the point it begins to shut down. A person with heat stroke may experience symptoms that include confusion, faintness, strong and rapid pulse, and possible delirium, hot dry skin or even unconsciousness. Continued exposure to very high temperatures can produce brain damage, and at 107 degrees cells with the body start to die and organs begin to shut down, quickly leading to death. In the summer of 2002 a controlled study was conducted to quantify how hot vehicles get and how rapidly they can reach dangerous temperatures. This research was published in Pediatrics and is maintained on line at http://ggweather.com/heat . The conclusions of the research were startling in how extreme the conditions inside a car can reach. Within the first 10 minutes a vehicle will warm to almost 20 degrees above the outside air temperature; after 30 minutes it is 34 degrees warmers and after an hour it plateaus at as much as 45 to 50 degrees higher than the air outside. Consequently, even on a mild 70 degree day temperatures can reach readings that can be fatal to an infant or small child. The research also found that “cracking” the windows had a negligible effect on the temperature. It has become the “go to” article on the topic and is used worldwide and hopefully this research will raise the level of interest and awareness about this sad topic and ultimately to save some innocent lives. The bottom line is that each and every one of these deaths is 100% preventable. Infants and children are the most precious cargo that is ever transported in a vehicle and we should always be cognizant of the potential dangers to a child left alone in a car. • NEVER LEAVE A CHILD UNATTENDED IN A VEHICLE. NOT EVEN FOR A MINUTE ! • Be sure that all occupants leave the vehicle when unloading. Don't overlook sleeping babies. • Always lock your car and ensure children do not have access to keys or remote entry devices. If a child is missing, check the pool first and then the car, including the trunk. Teach your children that vehicles are never to be used as a play area. • Keep a stuffed animal in the carseat and when the child is put in the seat place the animal in the front with the driver. • Or place your purse or briefcase in the back seat as a reminder that you have your child in the car. • Make "look before you leave" a routine whenever you get out of the car. Please let me know of any additions, corrections etc. Enjoy. and it has raised the likelihood of El Nino occurring in Fall 2014 exceeding 50%.